Did you know that over 1 in 3 Americans have listened to a podcast? 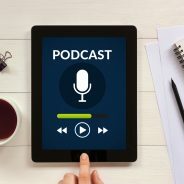 A few years ago, the popularity of blogs was king, but today, podcasts are making their mark as well. After you have recorded your podcast, you will be ready to draft a few notes. Instead of a one-liner about the show, think of how you can optimize these show notes for SEO and link sharing. Include relevant links where people can read more about the speaker and tag companies and people who are involved in the podcast in your show notes. When crafting the headline of your show and the show notes, use keywords that your company is targeting. Listen to the podcast from a marketer’s point of view so that you can include as many relevant keywords as possible (without being spammy!). If there is a high-profile guest on your show, include their name in the Meta title of the page. If your podcast guest does not have a large existing following, use other keywords instead. If you want people on social media to share links to your podcast, then the show notes need to be crafted so that they are highly sharable. To do this, include a compelling call to action, creative copywriting, and use a strong image to accompany the show notes.